In summer days it causes a lot of fresh and healthy eating. Any recipe with fish is perfect for that time of year. If we mix seafood with salad in one dish, we would have the perfect food. 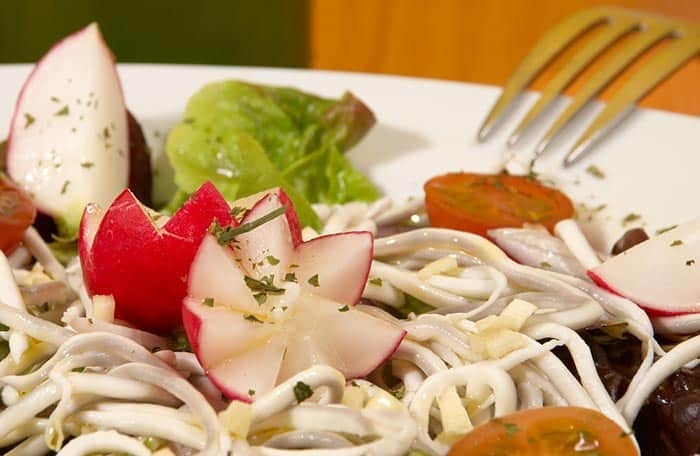 Well, let's welcome the salad of gulas. The gulas usually eaten as a tapa sauteed with garlic and chilli and more nothing. But you can also eat in the form of a salad. And that's what we're going to teach you next. 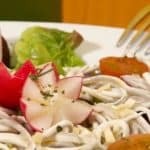 To make this recipe you will need gulas in preserve With two cans you will have enough for one or two servings of this dish. Step by step preparation of a delicious gulas salad with garlic cloves, cherry tomatoes, lettuce and radishes.Chop the garlic clove very small. We put a stream of olive oil and the gulas to the fire for a couple of minutes. Remove and let cool. Wash the lettuce well and cut the leaves with hands. Put it in a salad bowl. Wash the cherry tomatoes and chop them in half. Put them in the salad bowl. You will also wash the radishes and cut them in halves, or in rooms or in any creative way you want. Put them next to the tomato and the lettuce. Add a little salt, a pinch of oregano, a little olive oil and stir well with a wooden spoon. Done, you already have the salad with greens made. Prepare the recipe exactly the same to how I explained it. At the end, just at the time of serving, add 100 grams of smoked salmon chopped into medium pieces. In this case the recipe is also the same as the original but you will also use fresh peeled prawns. When you are cooking the gulas in the pan, add the prawns and cook until they are white on all sides. You incorporate them into the recipe and ready. You can also use some salty biscuit or hard bread that they sell in the supermarket to spread with things. We invite you to visit the page of Salads recipes where you can find a lot of simple and delicious homemade recipes.